Red Velvet experienced an explosion of popularity in the last few years. Besides the namesake cake, Red Velvet is now available in cupcake form along with pancakes, cookies, ice cream, and even lattes! The cake has gained popularity in the 20th century, but its roots stretch further back. Like with many recipes, the Red Velvet Cake’s true origins aren’t completely known. However its history can be traced back over the years thanks to cookbooks, recipes, and advancements in food production. Velvet cakes had been made since the 1800s. Recipes called for the use of cocoa to soften flour and make finer texture cakes. This smoother texture gave these cakes the name Velvet cakes. A Mahogany cake also was popular which incorporate cocoa and coffee (its cousin being Devil’s Food Cake). By the early 1900s recipes surfaced for cocoa velvet cakes, red cocoa cakes, and other variations. One of the most prominent mentions of Red Velvet cake came in 1943 in Irma S. Rombauer’s “The Joy of Cooking” (yes – the book that inspired Julia Child’s career). While Ms. Rombauer was not a fan and made note of this in her book, it was one of the first nationalized mentions of the Red Velvet cake. When items ideal for baking (specifically sugar and butter) were rationed during World War II, some bakers began adding beets or beet juice to their cakes. This was done for a variety of reasons. The red from the beet juice made the cakes more appealing, and the beets also acted as a filler and kept the cakes moist. Some red velvet recipes do actually call for beets, but there is no clear correlation between beets and Red Velvet cake, but rather just one theory on the cake’s origins. The Adams Extract company attributes itself to making the “original” Red Velvet cake in the 1920s. Currently you can buy the mix from the company in its vintage packaging. The Waldorf Astoria Hotel in New York City also claims it is the birthplace of the Red Velvet cake, with it being a popular menu item in the 1950s. Some argue that the Red Velvet cake started in the south. While there is no one clear answer, we do know that something between the 1920s and the 1950s, Red Velvet became popularized in the United States. 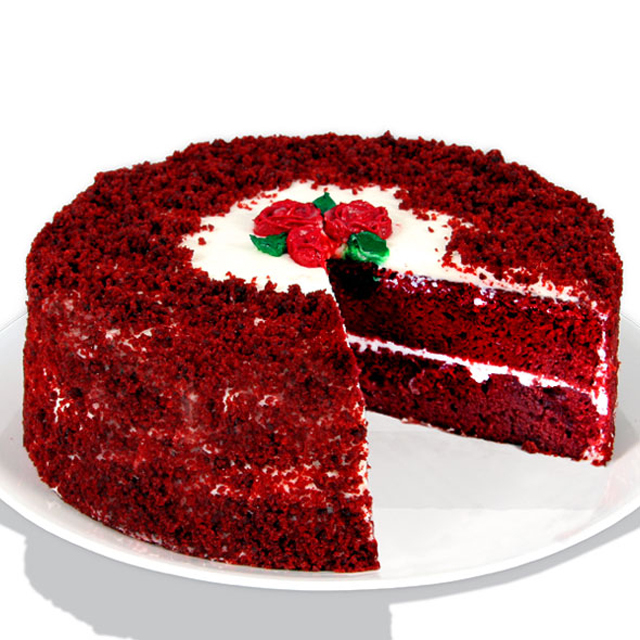 Present day Red Velvet Cake relies more on red food coloring than it does on beets. Another reason why food coloring is used to give the cake its signature color is because of the way cocoa is now processed in the United States. Most cocoa available in the groceries stores is known as Dutch process cocoa. The thing is natural coca is fairly acidic. When it is processed, the acid is reduced while creating a rich brown color. It is the acid in the natural cocoa that reacts to the buttermilk creating a reddish hue. Because natural cocoa isn’t as widely available, bakers opt instead to use Dutch process cocoa and add food coloring to give the cakes their color.